If you hadn't already heard, Berlin is fast becoming the main hotspot for vegan travellers. With its wide variety of vegan restaurants, cafe's, supermarkets and shops it has really made a name for itself as a vegan landmark! When my husband and I decided to have a little winter mini break away this year, there was only one place on my list that I wanted to visit - Berlin! Not only is Berlin amazing for vegan travellers, it's also an incredibly vibrant and arty city with so much history and culture to immerse yourself in. In November the Christmas markets begin and Berlin has more Christmas markets than any other German city so it's the perfect place to get into the festive spirit and pick up some gifts. Whilst in Berlin we booked a table at the Kopps vegan restaurant which is highly rated on Trip Advisor. This was a real treat! I loved that every dish at Kopps seemed to just celebrate vegetables and their versatility. I did find that a lot of vegan eateries in Berlin try to create alternatives to meat which is great for the people who have really struggled to eradicate meat from their diets. But for me I didn't like meat in the first place so I am not looking for a fake alternative. Talking of fake alternatives, we just had to try the Voner vegan doner kebab shop! It was something I needed to see to believe. I had heard things about it online and I was keen to try it for myself although I kind of knew before we got there that it wouldn't be for me. And unfortunately I was right! But the chips & salad were really good. I was so impressed to see that Berlin has its own vegan supermarket Veganz! The idea of a supermarket which purely stocks vegan only goods seems like an impossibility here in the UK, but Berlin is demonstrating to the world that this can be a reality. Veganz is situated on a road that has become known to the locals as 'Vegan Avenue' as not only is there a vegan supermarket and cafe, but there is also a vegan fashion shop called Dear Goods which stocks a variety of vegan & eco friendly clothing and accessories. Obviously whilst in Berlin I needed to get my vegan sweet fix so we headed over to the extremely cute vegan cafe Oh La La , where we indulged in some delicious crepes! We had a truly memorable time in Berlin. It's an amazing city with something for everyone - not just the vegans! Last night my husband and I decided to watch the 'Vegucated' documentary on Netflix. As I am transitioning from being a vegetarian to a vegan I am trying to educate myself more about the benefits of a vegan diet and I thought this film would be a good starting point. Although this film is slightly dated and a little bad quality in terms of filming, it has really motivated me even more so to become a vegan. It has really moved me into new place in my life and a new way of thinking. I honestly don't think there is any going back now. The documentary follows three americans who volunteer themselves to adopt a vegan diet for six weeks. We get to see their their highs and lows first hand and how they begin to educate themselves around the factory farming and animal agriculture. Before watching this film I don't think that I was aware of just how cruel the dairy industry is. As a vegetarian I felt like I was making a real difference by not eating meat but now I am realising that dairy is really no different in terms of animal suffering. If I want to make a bigger difference to the lives of animals then I know that I need to become vegan. This film had such an impact on my husband that he actually went out and bought some soya milk today. Bearing in mind that this is someone who loves his traditional cups of teas more than anyone else I know, this film has even managed to change his mind. Sometimes it can be hard to face up to the reality of what's going on in the world. I have many friends and family members who tell me that they can't watch films like this because it will upset them too much. Well if you can recognise that this film might upset you then maybe you need to ask yourself why? In any case, this film is much more informative than it is upsetting. Yes there are some clips which are hard to watch but ultimately this is something that people need to watch instead of living in ignorance. As long as we continue to fund this industry animals will be subjected to unthinkable amounts of suffering and I am so happy that films like Vegucated are bringing these issues into the mainstream. 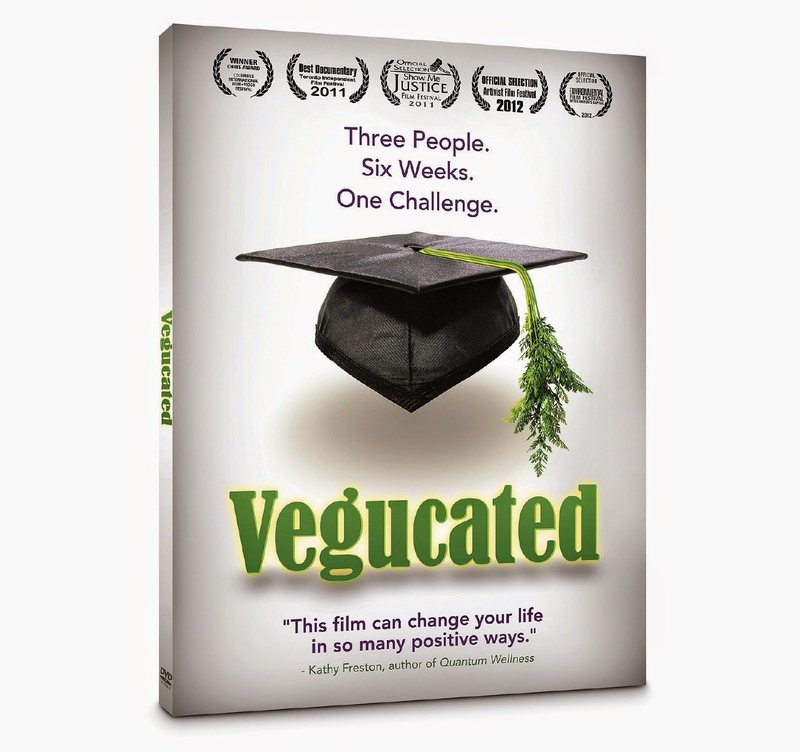 I would love to hear your thoughts on Vegucated so please comment below if you have watched it. Today we visited Manna Restaurant in Primrose Hill, London, for a spot of lunch.